Any responsible trial attorney will devote a substantial amount of time and effort toward preparing for a criminal trial. The process is long and rigorous, as well as expensive. Then the big day finally arrives. The jury is selected, the trial begins, and everything seems perfect. The defendant cannot even conceive of being found guilty. Then the unthinkable happens and the defendant is convicted. What happened to all of the time, money and effort that was expended on trial prep? Was it all wasted? Of course not. A trial record was created. That record is now the basis for an appeal to the Appellate Division of the New Jersey Superior Court, or the United States Court of Appeals for the Third Circuit. Many clients feel a sense of hopelessness after losing at trial. They believe their view of the facts was correct, but the system let them down. The can become discouraged, give up, and simply resign themselves to their situation. However, criminal cases do not end after a loss at trial. Our criminal justice system is the best in the world, but mistakes are not uncommon. Criminal defendants have the right to have their convictions reviewed on appeal. This means that a panel of appellate judges who were not involved in any way with the trial will review what occurred during the trial with a fresh set of eyes to determine whether the proceedings and resulting conviction were fair, just, and consistent with applicable laws, rules and procedures. At this stage, a different process requiring a different set of skills comes into play. A skilled appellate attorney must review the trial record with the goal of identifying viable appellate issues, and formulating the best manner to present those issues to an appellate court. Speedy action is required at this point. After a jury returns a finding of guilt, the case will enter the sentencing phase. The defendant will be interviewed, a sentencing report will be prepared for the trial judge, and the court will schedule a sentencing hearing. A good trial attorney will continue to make the record as complete as possible by making appropriate post-trial motions and preparing arguments for the lowest possible sentence. Defendants and their families do not have to remain idle at this juncture. Rather, as soon as a guilty verdict comes in, they should immediately commence the process of interviewing and selecting an appellate attorney to represent the defendant during the next stage of their case. The fight is far from over - the parties are simply going to another venue to attempt to secure the result that, for whatever reason, was not obtained at trial. The criminal appeals firm of James S. Friedman, LLC, strongly recommends that a defendant retain appellate counsel as promptly as possible after the jury returns a guilty verdict and prior to sentencing. 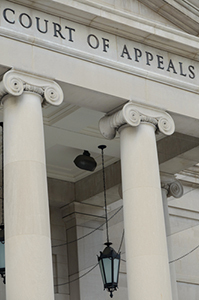 The appellate attorney can then immediately begin the work of assembling the materials generated in connection with the trial that will be required for the appeal. This results in a smooth transition from the trial phase of the case to the appellate phase, thereby reducing the likelihood of mistakes, as well as missed deadlines that could result in a total loss of appeal rights. Defendants must act quickly to protect their right to an appeal or they risk losing it. Every appellate court has a deadline for commencing an appeal, and the appropriate papers must be filed and served within that timeframe. If you lost at trial and got convicted, do not simply resign yourself to your fate. Our criminal justice system affords you the right and the mechanism to have your situation reviewed. Protect what the law gives you, and contact an experienced appellate attorney who has the skills and experience necessary to take your case to the next level. James S. Friedman, LLC, represents criminal defendants in the State and Federal appeals court in New Jersey. If you are seeking to appeal a criminal conviction from the New Jersey Superior Court, or from the United States District Court in New Jersey, contact us online or call us toll free at 800-361-6554 to discuss your appeal.